September 9, 2018 11:10 am. Jack Frost claimed a special double when he outlasted his rivals to win an action-packed running of the Schweppes Great Northern Hurdle (4200m) at Te Aroha. 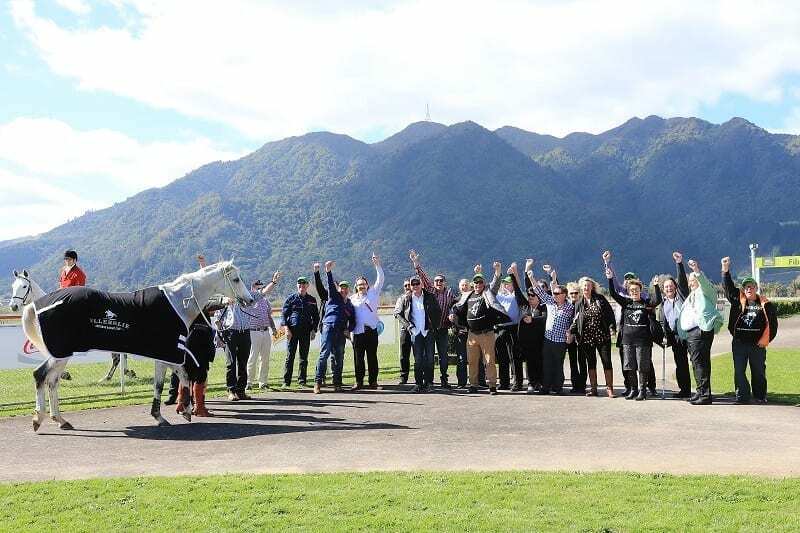 Scenes of unbridled jubilation from his large group of owners greeted the Brian and Shane Anderton trained eight-year-old as he made his way back to the winner’s enclosure after adding the biggest hurdle event in the north to his Grand National Hurdles title at Riccarton last month. Supporters of jumps racing couldn’t have asked for a better spectacle as the capacity field put on an enthralling contest from start to finish. Free-goer Banbury Lad set up a hectic pace in front as he strung the field out by up to thirty lengths in the early stages of the prestige event. Jack Frost and rider Buddy Lammas, who gained the mount after regular pilot Stuart Higgins was suspended for his ride on the horse in the Grand National, bided their time at the rear of the field as they conserved energy for a final charge. Former Sydney Cup winner Gallante and local favourite Laekeeper split the field wide open when they dashed clear with 1200m to run with the Paul Nelson trained Second Innings stalking them as they approached the home turn. By this time Lammas had Jack Frost humming as he closed in on the trio before issuing his challenge at the second to last fence. Second Innings hit the front but botched the two remaining jumps to succumb to the inexorable charge of Jack Frost who went clear in the run to the post as he sent owners, the Frosty’s Shoutin The Beers Syndicate, into a joyous delirium. “It was a wonderful training effort by Brian and Shane and we are indebted to their tremendous ability,” said syndicate member Michael House after the race. “It’s a great thrill and I don’t think I’ve ever yelled so much. They are a great bunch of weirdos (the syndicate) that just love racing and I’m indebted to their friendship on this journey. “He’s only a little slight horse but he has a tremendous staying ability. He was a race fit horse who was handling it well and seeing his fences better with each one he got to. “Brian Anderton said a couple of years ago this horse would make a great jumper even though he wasn’t training him at the time. “He’s ended up in his stable because of that vision.” Lammas, who was having his first ride on the Gallant Guru gelding, was remarkably calm after claiming the prestigious event. “We were a bit far back from where I wanted to be but when I popped out he just cruised up to them,” he said. “He travelled up nicely and when the front-runner mucked up the last couple we caught them quite easily then. It was the second major jumping victory for Lammas in less than a month after he claimed the time- honoured Grand National Steeplechase (5500m) on Shamal at Riccarton recently.